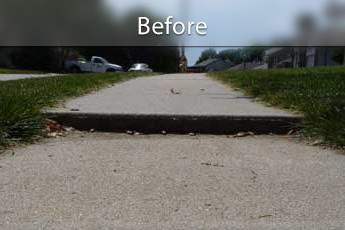 Does your driveway, sidewalk, walkway, concrete steps or patio have problem areas where sunken concrete has caused uneven surfaces and tripping hazards to form? It's a very noticeable problem that has a very simple solution. The Basement Doctor of Cincinnati is your trusted concrete expert. Conditions, where outdoor concrete has already begun to sink, are not uncommon in Ohio and Indiana and are often the result of shifting or a weak soil base or erosion. If you have noticed sinking concrete near your home in West Chester, Hamilton, Fairfield, Mason or nearby, call us today for a free estimate! 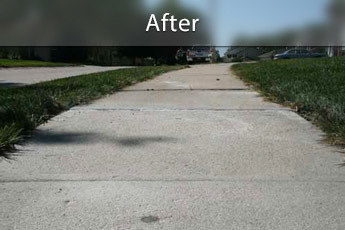 The Basement Doctor of Cincinnati can fix your sinking outdoor concrete problems so you can enjoy your driveway, sidewalk or patio again without worry. 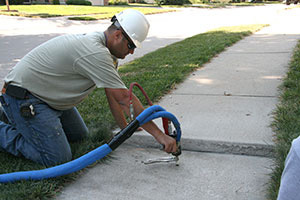 At The Basement Doctor of Cincinnati we use PolyLevel® to lift concrete slabs to a level position with less weight and disruption than the legacy mud jacking or slab jacking process. We would be happy to provide you a free evaluation and estimate for concrete repair and leveling in West Chester, Hamilton, Fairfield, Mason, Middletown, New Albany, Loveland, Fairfield, West Chester, Fairborn, Jeffersonville and nearby.